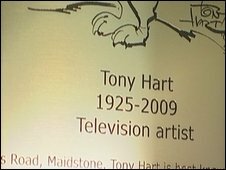 Television artist Tony Hart has been honoured in his home town in Kent with the unveiling of a plaque. His daughter, Carolyn Williams, was at the event at the Hazlitt Arts Centre in Maidstone on Saturday evening. She said: "It's absolutely marvellous. I'm sure he wouldn't believe it. If he was still around we would have to try and convince him this was the case." The memorial follows a campaign for a tribute in the town of his birth, after Hart died earlier this year, aged 83. His daughter, who grew up surrounded by stacks of paper and pencils, said: "With all his drawing and with the stuff that he did on his programmes, that was very much the man he was. "It wasn't a TV persona that he put on. "Always as he worked, he would talk about what he was doing. "But he would talk as if everybody understood absolutely what he was doing. He would never talk down. "He would just explain what it was and make this assumption that everybody was going along with it and understood entirely what he meant, which was just so endearing and so nice." She said she spent her childhood drawing on the backs of yellow scripts for his TV programmes, and her father never sat down and instructed her on how to draw. She said: "He would point out where things had gone wrong, and where perhaps scale was wrong, or something like that, but very gently. "He really just encouraged and encouraged and just made sure I had plenty to draw and paint and make things with." Mandy Hare, theatre and events manager at the Hazlitt Arts Centre, said there had been a huge public outcry for a memorial after Hart died earlier this year. She said: "We felt as a council that we needed to have some sort of commemoration for the fact that he had been born here and had studied here as well." 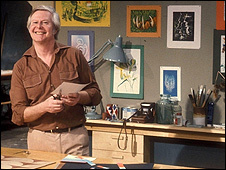 And she added: "Tony Hart is important to Maidstone - I think he's important to everybody. "He made a huge contribution to art and creativity in the country as a whole." Hart served as an officer in the 1st Gurkha Rifles in World War II, before joining a course at Maidstone College of Art. He entered television in 1952, after demonstrating his quick art skills in a chance meeting with a BBC TV producer, and became the presenter of Vision On, Take Hart and Hartbeat. Hart, who lived in Surrey, suffered from health problems for a number of years before his death in January. A Facebook campaign for a memorial statue led Maidstone Borough Council to agree to display a plaque, which was unveiled as part of the Hazlitt Arts Centre's first anniversary celebrations.